Current Structure: Designed in 1876, completed in 1886. The Statue of Liberty is accessible only by ferry. Departure points are available from New Jersey and Manhattan Island. ​In 1883, Emma Lazarus writes the poem "The New Colossus" in support of the project. In 1885, newspaper magnate Joseph Pulitzer took up the cause, calling for donated funds to build the pedestal. That same year, the statue arrives in New York City to great fanfare, but is put in storage for a year as the pedestal is completed. Built of Rosendale cement from the Hudson Valley and faced with granite, the pedestal was completed in early 1886. The statue is assembled on site that year and officially opened in October, 1886. Upon opening, President Cleveland declared it under the auspices of the United States Lighthouse Board - the Statue of Liberty was officially a lighthouse. Lighting the torch was fraught with complications due to use of the newly available electric lighting. 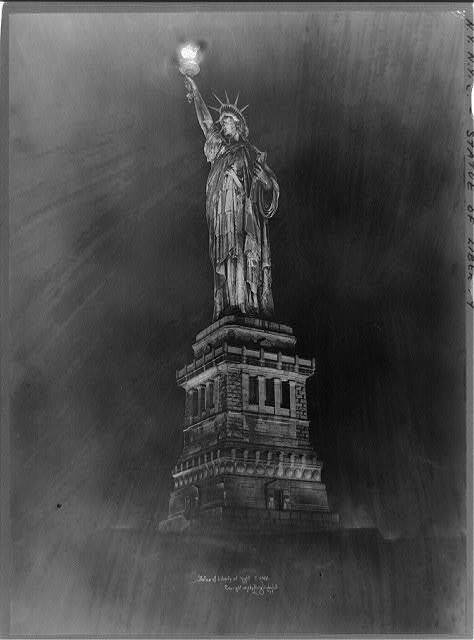 But on November 22, 1886, the Statue of Liberty became an operational lighthouse. Statue of Liberty at night. 1917, Library of Congress.